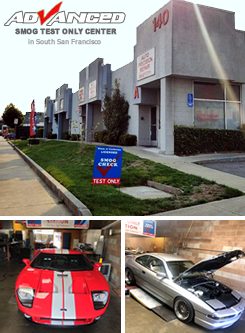 $35.00* South San Francisco Smog Check Coupon - Advanced Smog - 140 South Linden Ave Suite B, South San Francisco, CA. Phone: (650) 583-7664. Local South San Francisco Smog Station. Our tests take less than 15 minutes, and the fact we're a STAR Certified Test Only station eliminates concern for bait and switch tactics. We don’t perform repairs. Our only goal is to see you pass! Trust the value and quality of service our customers have come to enjoy for over a decade. Shop Hours: MON-SUN 9:00am to 5:00pm. We're open 7 days a week for your convenience. Smog Special: Get your smog test for only $35.00* with your SmogTips coupon. Plus get one free retest. We want you to pass the first test! *+$10 CA cert. & ETF. +$10.00 for 1996 to 1999. +$20.00 for 1995 & older. Excludes RVs. More certified smog station near South San Francisco, CA.